“Judge me by my story, and not a minute sooner.” – The Art Of Realistically Achieving Your Happily Ever After. In life we’ve all had good and bad experiences. We go through different stages of our lives’ and we ALL have to take in the good and the bad. Sometimes, when things feel really wrong, and your at your lowest point- something may happen to change your negative experience into a positive one. I wanted to tell you a story of a time when I hit rock bottom, and also tell you something amazing that happened right after I was hit hard, which gave me the strength to stand back up. This took place in 2014, when I was working in the pediatric intensive care unit at a large hospital in St.Louis, MO. Daily I would take care for VERY ill children. Some kiddos had been in an accident with a head injury, or maybe needed surgery so they need to recover in the ICU to ensure they are stable. A lot of asthmatics, and patients’ on ventilators. I recently wrote a post about “The moment I realized critical care nursing wasn’t for me.” That might not be the exact name of it, but you will see a blog post talking about critical care nursing ( so go read that article, if you haven’t yet). I was working full time nights, so 7pm-7:30 am. My body was not adjusting well, and I was starting to crumble from all of the horrible things I saw while working there. Am I mad at myself for only lasting 8 months in the PICU? No, I am not mad. I’m actually proud of myself for being able to last that long. I feel strong for being able to recognize that this had began to affect my everyday life, and I needed to make a change. 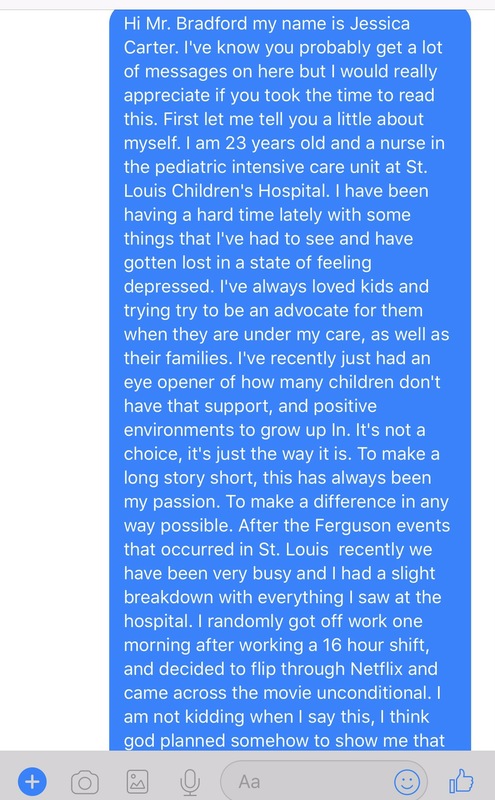 My goal in life was always to be a pediatric ICU nurse, so I was crushed when I realized it just wasn’t for me and had to move on to another area of nursing that would allow me to continue to help people, but without as much stress. It was taking a huge toll on me physically, mentally and emotionally. Every time I walked through those hospital doors, my heart sunk into my chest and I was scared. Legit scared, and I’m not being a diva and making it seem worse than it really was. It gave me anxiety knowing how critical these kids were, and a lot of times there were very bad child abuse cases. Again if you read the post I mentioned earlier, you will understand the exact moment I knew I couldn’t handle it anymore. I know adult and pediatric ICU settings can be tough no matter what, but in my opinion it is harder taking care of children in the setting, due to the fact that their injuries are normally intentional and out of their control. REAL EXAMPLE: Taking care of an infant who is on a ventilator with severe burns, because someone intentionally tried to kill him. Not an accident, which we all know can happen. Everyday, accidents happen and it’s unfortunate. This was Intentional. I will never understand. It broke my heart that night. It was one of those ” I need to go cry in the bathroom for 10 minutes, okay probably more like 30″ nights. So after this particular night, I go home and I’m wide awake from the caos that I just experienced, so instead of sleeping my mind was racing. I was crying and felt so depressed and anxious. I was dating my now husband at the time and he recommended me to watch something happy on Netflix, to try to get back on my feet, and in a better mood. So, I agreed. I tried to find a documentary, or funny movie, but then I saw a movie titled “unconditional”. On the bottom, where it gives you a summary of what the story is about, it intrigued me, it didn’t look like funny movie, but when I’m feeling down, I personally don’t want to watch a funny movie or show. My night was not funny, and I didn’t feel like laughing. I just wasn’t in the mood for that. Everyone’s different but that would not help me “cheer up, and feel better”. The summary of “Unconditional” seemed like a true, and down to earth story, maybe something I could relate to. So I made breakfast, sat on my couch, and started watching. It drew me in immediately and by the end of it, it was a done deal- I felt INSPIRED and my hope in humanity felt restored after being destroyed a few hours earlier. I couldn’t stop thinking about that movie and maybe watched in 3 times in that same week. It hit a spot in my heart, mind, and soul. I felt sadness and happiness all rolled into one- in a good way. Therapeutic you could say. Since “Unconditional” is based off a true story, I had to find the real guy that this movie was based on. I had to talk to him. I had to thank him for turning my energy upside down after the worst night of my life. I had to thank him for making me realize the importance of helping others’ and in general being kind to one another and helping others’ anytime your able to. I wanted to tell him the timing was perfect for me to watch this movie. I felt like it was a fate. I typically don’t think “everything happens for a reason”, but I felt that this was an exception to my doubts. 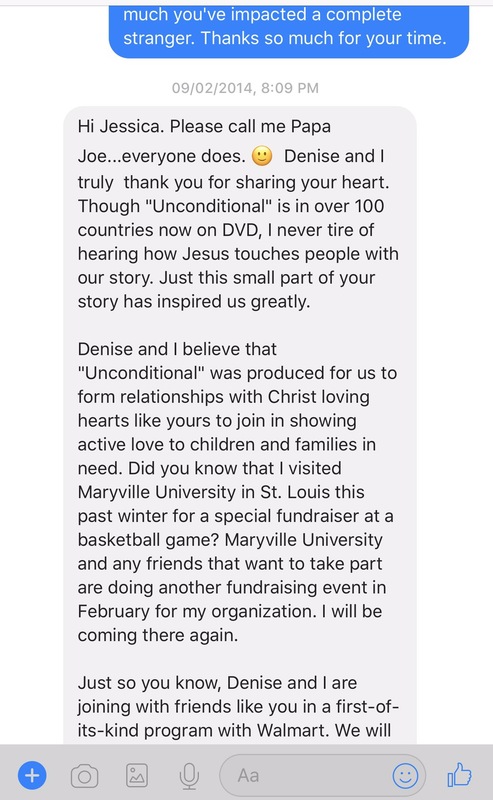 Unconditional Movie Trailer -click here This will allow you to get a little sneak peak of the movie! In this film inspired by true events, successful author/illustrator Samantha Crawford is living a charmed life, until her husband is murdered. She’s plunged into despair, and loses her faith. It’s only after an unexpected meeting with a childhood friend, Joe, that she begins to feel a faint glimmer of hope. As she sees the impact Joe has on so many people, her heart is opened to new possibilities. But when she is pulled back into her husband’s murder case, her newfound hope will be tested. As I said before, I was GOING to find him one way or another. If you don’t know me personally, then you don’t know that I’m the most persistent person you’ll ever meet, and I do not give up on my goals until their acccomplished. So, just like I said I would do, I found him. I’m not going to post our entire conversation but here’s bits and pieces. If you watch the movie I think you would understand why I was so passionate about it, and truly inspired. Tip: WATCH IT NOW. We recently spoke again, so I have random shots from both conversations, but you get the point. 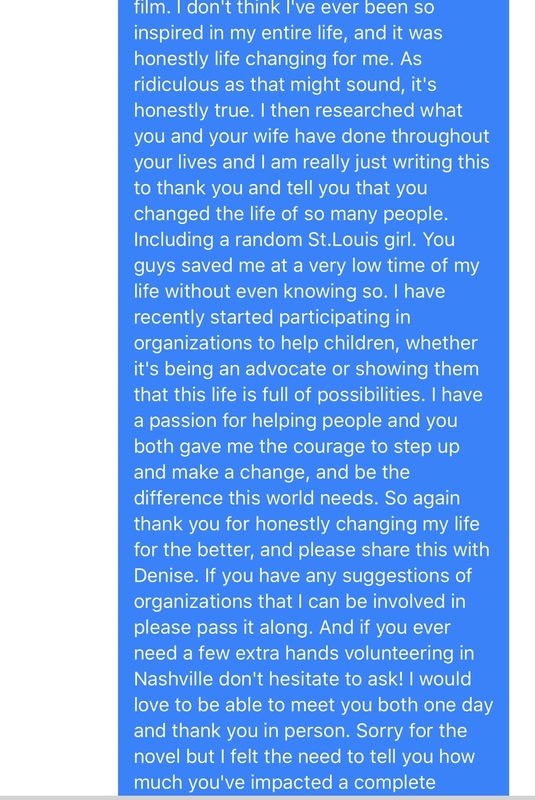 I did what many are too scared to do, and I thanked someone for being inspirational, a role model, and just a great person. I thanked someone who saved me at a low point in my life, by simply making the world a better place. I randomly saw a film that was based on this man, and it couldn’t of happened at a better time. Sometimes timing is everything. This movie will inspire you to walk on the clouds! That’s really the theme as Samantha Crawford is reminded of the book she once told her husband she wanted to write. A story about a little bird that encountered the storms of life but by walking on the clouds learned that the sun still shines above the clouds. Samantha forgets this for a time after her husband dies by being shot during a robbery. 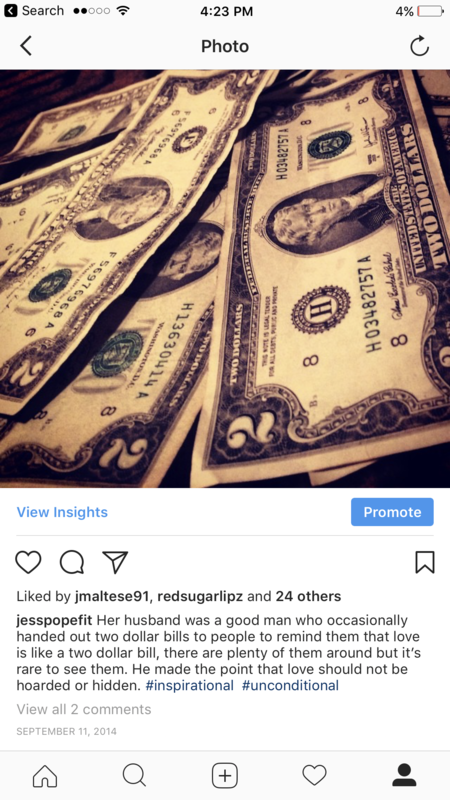 “Her husband was a good man who occasionally handed out two dollar bills to people to remind them that love is like a two dollar bill, there are plenty of them around but it’s rare to see them.” He made the point that love should not be hoarded or hidden. Another huge lesson I took learned from this movie was based on Samantha’s husband and his way of reminding others’ that love should never be hidden or hoarded. Using the $2 bill as an example. We never see these around anymore because people find them rare, so they keep them locked up and hidden. Since watching this movie, I’ve started my own tradition that I do monthly to promote this message. I’ve never shared this with anyone, but I think it’s okay for the world to know. I am not ashamed of it whatsoever, but I’ve never felt the need to share it with others’. The reason I am deciding to at this time, is because of the horrible acts that we see and hear of around the world. Hate, racism, crime, etc- the love is rapidly decreasing everyday that goes by. 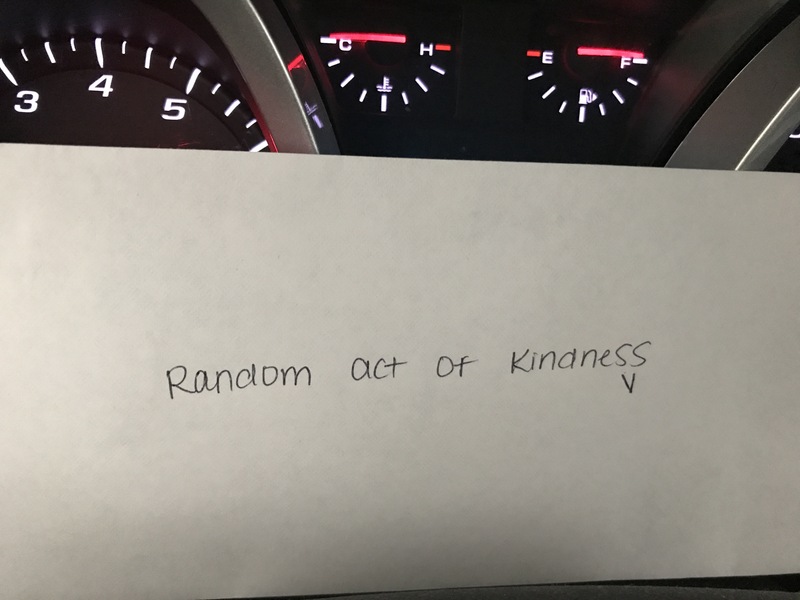 I hope this encourages others’ to participate in small or random acts of kindness. To make time for it to be a part of their lives. This picture was posted on my Instagram on Sep 11th, 2014, and I’ve kept the tradition going ever since. Monthly, I will take in lessons I’ve learned and words of encouragement, and write a letter. A letter to a random stranger. A letter letting someone out there know, that everything is going to be okay. When bad things happen, it shouldn’t define us. To make it known that no matter the circumstances, they ARE worth it. To take a bad situation and turn it into something positive. It doesn’t have to be anything extravagant- a small act of kindness can turn someone’s world upside down for the better. I include a $2 bill, and share my story, and the reasoning behind the $2 bill they just received from a random stranger. I give my prospective on the importance of it, and hope they can pass this along to the next person. I’ve had many comments said to me for example, “your life seems so perfect”, “you have it so good”, people act like I don’t have struggles like the rest of the world. My life is what I make of it, and it is not perfect. My choices are what define my life, and I try to make the best choices possible for myself and my family. Before you make assumptions, positive or negative, get to know me and form your own opinion. Use this strategy, and apply it to your everyday life. If you see a homeless person sitting on the side of the road, don’t assume they can “just go get a job like anyone else”, don’t assume a young teen mother, “is stupid or foolish and irresponsible”. You have permission to form your opinion on someone after you know their story, and not a minute before. I hope this message can encourage people to step back, and really soak in what I’m saying. I hope it will allow people to never judge a person, simply based on the color of their skin, or the clothes they are wearing. I hope it encourages more people to help one another, even if it’s something simple. You may not think it’s “a big deal”, but to someone else it might help in greater ways than you think are possible. 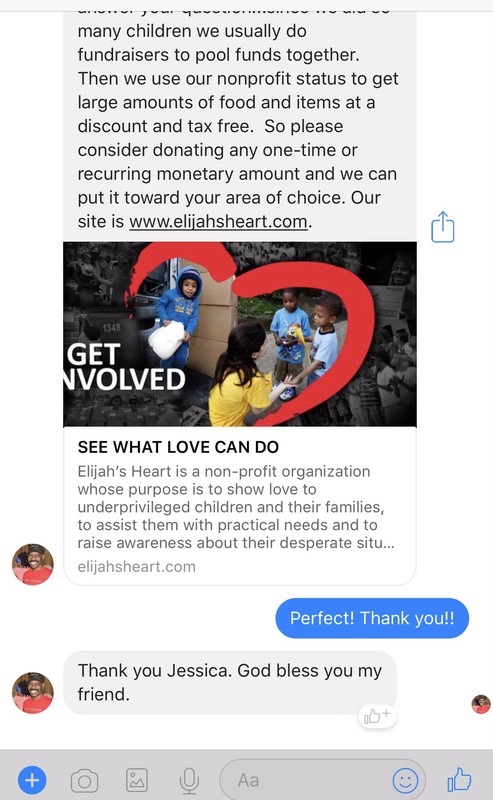 Mr. and Mrs. Bradford are a part of “Elijah’s Heart” which is a non-profit organization whose purpose is to show love to underprivileged children and their families, to assist them with practical needs and to raise awareness about their desperate situations to inspire others to act. If you would like to help this cause please CLICK HERE !